Posted Jan. 12, 2014, 3:46 a.m. I thought it would be good to give this post-jam wrap-up a permanent home here. You know, for posterity. 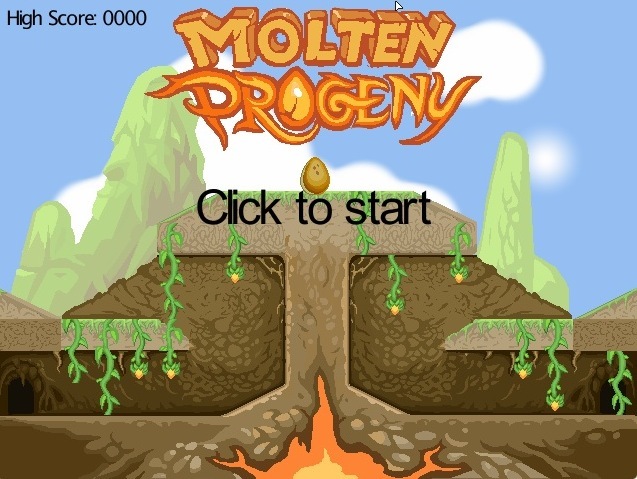 I never imagined that my first game project would be called "Molten Progeny." To me it sounds like melted baby, but when we named it we were too tired to come up with a more elegant description of what this project is about. Molten Progeny is a game about a phoenix atop a volcano desperately trying to protect her egg from hungry reptiles. Thematically, she only gets one egg. It's not surprising that the first jam game I was able to finish was made at a real-world meet-up. I was fortunate enough to have three talented artists at my disposal since few of the attendees could program. Working with them motivated me to finish the project so their hard work could see the light of day. My team did a great job with the art, but after seeing some of the feedback the game received it became apparent that the project had some shortcomings. As we made the art assets, I did some simple manipulations to generate placeholder art for the various animations and enemy types using Pixen. Strangely, every time I saved a PNG in Pixen the color seemed to lose a little saturation, so you might notice the shade of enemies facing left a bit lighter than those facing right. Due to time constraints, a lot of placeholder art ended up in the final game. In fact, the only enemy with complete attack and walking animations is the Strong Nasher. Luckily, this gives them a sense of weight and importance that the other enemies lack, which is appropriate since they are strongest and toughest. The other enemies just skate along with no animations, which is less noticeable because of how quickly they move. From what I've seen, most players score somewhere between 150 and 250 points, which is enough for all the basic enemy types to have been introduced but not enough to have seen all the combinations of those enemies. The spawn rate and composition could have used more tuning to make the difficulty ramp less dramatic. Even I can only get between 800 and 900 points and I'm the guy who programmed the thing. To incorporate the theme of "you only get one" we used the fairly common "defend something from waves of enemies" game type, the idea being that you only have one of the thing you're protecting. Our implementation of the theme ended up feeling a bit too routine, to the extent that some players didn't see it at all. The theme was incorporated into the ending as well, which would have made up for it except that most players didn't interpret it as we had intended. Some players were confused about the ending of the game, which is mostly our failure so I'll explain what we were going for. As the phoenix becomes overwhelmed, her egg cracks to the point that she swoops in to protect it. The volcano on which the egg is perched erupts, consuming everything. When the scene is over the player sees a phoenix hopping around in the aftermath. Most players took this to mean that the egg had been destroyed and that the mother remained to mourn her loss. What I had intended was for the mother phoenix to be consumed in the eruption, protecting her egg, which hatches into the baby phoenix the player sees on the score screen. We tried to differentiate the two characters by giving the child less developed wings and beak, a higher pitch, and having the child hop around instead of flying. Since the score screen transitions directly to the title screen - which shows an intact egg atop the volcano - it sort of implies a cyclical narrative of rebirth, that the child born of the volcano nests there again and has to protect its progeny from the same dangers in the next round. It that sense, you only get one phoenix, who is continually reborn. I'm really happy to have finished this project and had the opportunity to work with a team. I had no idea how intense game jams were, but I came away with a firmer understanding of what goes into making games and how to improve my design skills. Molten Progeny's project page is over here.